One of the more interesting woodpeckers in my book is the Northern Flicker…aka Yellow-shafted Flicker. It was once called the Yellow-shafted but a few years ago the name was changed to Northern Flicker (yellow-shafted form). There is also a red-shafted form of the Northern Flicker woodpecker found out west. They were two separate species at one time but experts in the field found that they were very similar to each other. One having reddish flight feather shafts and the other having yellow flight feather shafts. So they decided to rename the two birds to Northern Flicker. I love this woodpecker because of its striking plumage. It makes me think of a bird wearing a fancy suit with its black bow tie looking stripe at the top of its breast with the rest being dotted with black. Its back is golden-brown in color that is barred in black. Add a little bit of make-up around the face…yellow around the eyes and a red streak from its beak to the top of its neck and you have the yellow-shafted form. And….if you are still not sure you will see a flash of white on its rump when it flies. It comes in to my yard periodically, especially in the winter time. You can attract them in with suet that contains seeds and nuts which is how I do it. Other than that they spend most of their time near the open woods or on the edges of forests. If your backyard backs up to woods or if you have a few trees in your landscape, you will generally see them near the base of the them hopping on the ground looking for ants mainly but also beetles, termites, and caterpillars. They may also be seen feeding on fruits and berries up in trees. A Northern Flicker’s call is a loud, high-pitched sound similar to that of the Pileated. Although the call of the Pileated is a little slower in beat. This woodpecker is a medium to large size woodpecker and is about 11 – 14 inches in length with a 17 -21 inch wingspan. They like to make their nests in dead or diseased tree trunks about six to fifteen feet from the ground. It is one of the few woodpeckers that migrate. Males are known for drumming in long continuous rolls made by rapid blows with his bill. This is to attract a mate. Males like to do their drumming on the loudest and noisiest spot. Sometimes this could mean the flew on a fireplace or anything metal. This woodpecker eats more ants than any other bird in North America. It uses its long barbed tongue to scoop up the ants. Breeding season is from March to June. Both male and female flickers build the nest and they both incubate the eggs. Flickers feed their young by regurgitating their food. Added Note: Northern Flickers will come back to the same spot year after year to do their drumming to attract a mate as it worked for them before so why not try it again right? My husband and I have found this to be very true from our own personal experience. Something must have happened to that bird or it just moved on as eventually over time the noise making completely stopped. Thank goodness for that! 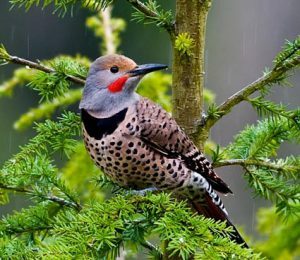 The Northern Flicker is a striking woodpecker that can be found in open wooded areas, at the forest edge, or even in your back yard. 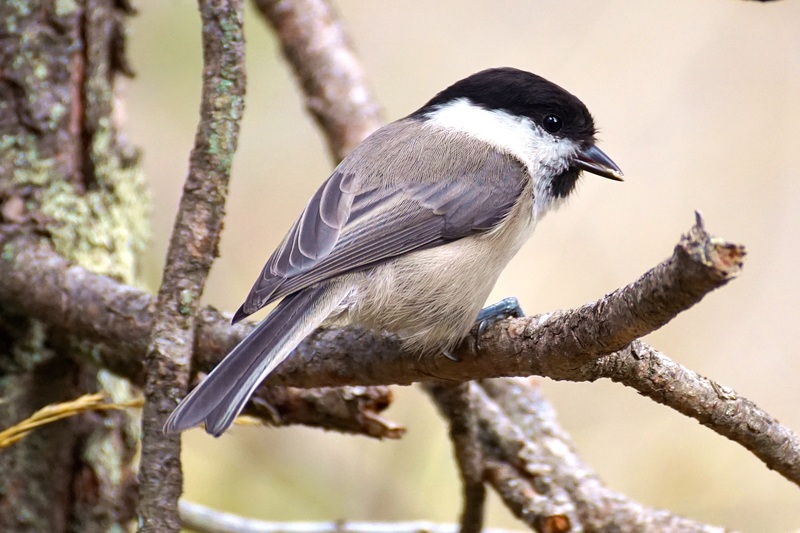 They like to feed especially on ants and can be seen at the base of trees hopping back and forth trying to uncover them or beetles, caterpillars, or termites. They also like berries and fruit too and can be found in trees that bear them. 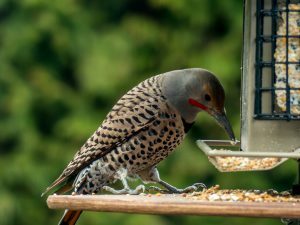 Flickers generally do not come in to your feeders but are attracted to suet that contains seed and nuts. That is what I put out for them and I get them fairly regular in winter time. They are always a joy to see with their fancy golden brown back that is barred in black and its bow-tie black spotting at top of breast. How do I know they are out there? I hear their loud high pitched call that you just cannot mistake. 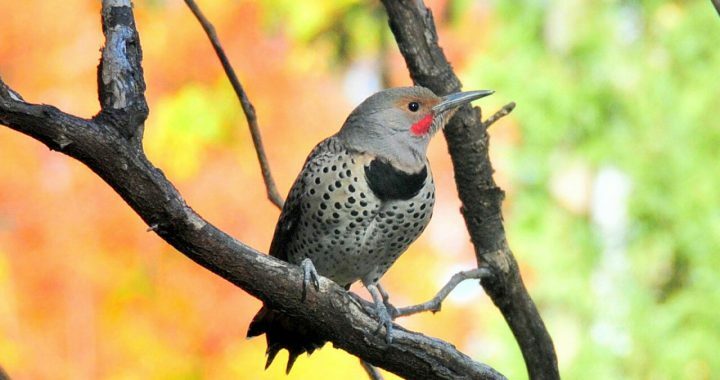 Do you have any Northern Flickers in your yard? Are they coming in to your feeders or just looking for insects in your yard? Which one are you lucky enough to see…is it the yellow-shafted form or the red-shafted form? I would love to hear about your experience with this fascinating woodpecker or any comments that you may have about them. Feel free to make them below.